William T. Trego | Catalogue Raisonné | Mounted Cavalryman, n.d. The painting is an unfinished oil sketch, perhaps a study for another work. The cavalryman holds his left hand in such a way as to suggest that the artist intended him to hold a flag or sword. His face is virtually featureless. The brilliantly colored sky of yellow and pink has only one other counterpart in Trego’s work: the c. 1900 cityscape of North Wales, Pennsylvania, in North Wales at Dusk. 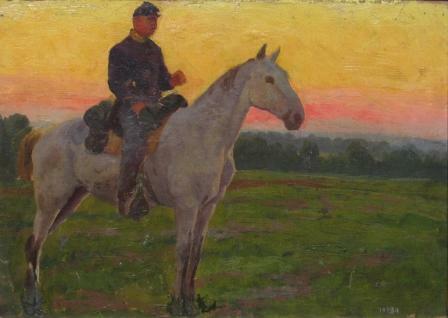 It is likely one of Trego’s late works, perhaps one of the last military-themed works he did before giving up military history painting completely around 1900. The signature is unusual in that it is in white and gives only the artist’s last name. It is the only known instance of such a signature. Because of this and the uneven way it is painted, we must allow for the possibility that it was added by another hand at a later date. The owner who consigned it in 2008 to the Vose Gallery had owned the work since 1960, but had no prior provenance for it. The sketch appears to be in good condition.